"Des Plaines" redirects here. For the river, see Des Plaines River. Des Plaines /dɪs ˈpleɪnz/ is a city in Cook County, Illinois, United States. Its population was 58,364 at the 2010 census. The city is a suburb of Chicago and is located just north of O'Hare International Airport. It is situated on and is named after the Des Plaines River, which runs through the city just east of its downtown area. Location of Des Plaines in Cook County, Illinois. Potawatomi, Ottawa, and Ojibwe (Chippewa) Native American tribes inhabited the Des Plaines River Valley prior to Europeans' arrival. When French explorers and missionaries arrived in the 1600s in what was then the Illinois Country of New France, they named the waterway La Rivière des Plaines (English translation: "River of the Plane Tree") as they felt that trees on the river resembled the European plane trees. The first white settlers came from the eastern United States in 1833, after the Treaty of Chicago, followed by many German immigrants during the 1840s and '50s. In the 1850s, the land in this area was purchased by the Illinois and Wisconsin Land Company along a railroad line planned between Chicago and Janesville, Wisconsin. In 1852, the developers built a steam-powered mill next to the river to cut local trees into railroad ties. Socrates Rand then bought the mill and converted it into a grist mill, which attracted local farmers. The Illinois and Wisconsin Railroad made its first stop in the area in the fall of 1854. In 1857, the Chicago, St. Paul, and Fond du Lac Railroad began running its route, stopping near the mill on the Des Plaines river, where a small business section had grown up. The railroad platted the prospective town of Rand at the site. In 1859, the Chicago and North Western Railway purchased the rail line, giving the train station the name "Des Plaines". In 1869, the Rand subdivision's name was changed to Des Plaines, and the village of Des Plaines was then incorporated. Des Plaines was reincorporated in 1873 and elected a village board the following year. Local brick manufacturer Franklin Whitcomb served as the first Village President. In 1925, village residents voted to convert to a city form of government and annexed the village of Riverview to the south. Subsequent annexations included the Orchard Place area in 1956. The city experienced rapid growth after World War II and with the opening of nearby Chicago-O'Hare International Airport. Des Plaines was the site of Ray Kroc's first McDonald's franchise, which opened in 1955. The restaurant was demolished in 1984, and a replica was built on the site as a museum dedicated to McDonald's history. In 2017, McDonald's announced plans to demolish the building due to repeated flooding. In 1979, Des Plaines was the site of the accident of American Airlines Flight 191, in which a McDonnell Douglas DC-10 departing from O'Hare lost an engine and wing material and crashed near a local trailer park just north of Touhy Avenue. All 271 people onboard the aircraft died, as did two workers at a repair garage. Two more, along with three civilians, were injured. In 2008, the Illinois Gaming Board awarded the state's 10th and last casino license to Midwest Gaming and Entertainment LLC to build a 140,000-square-foot (13,000 m2) casino on approximately 21 acres (85,000 m2) adjacent to the Tri-State Tollway at the northwest corner of Devon Avenue and Des Plaines River Road. Midwest Gaming received the award despite having the lowest bid because other bidders were found unacceptable by the Board, with one board member finding no bidders acceptable. The city approved zoning in early 2010, and the casino opened in July 2011 as Rivers Casino. Des Plaines is located at 42°2′2″N 87°53′59″W﻿ / ﻿42.03389°N 87.89972°W﻿ / 42.03389; -87.89972 (42.033848, −87.899786). According to the 2010 census, Des Plaines has a total area of 14.415 square miles (37.33 km2), of which 14.28 square miles (36.99 km2) (or 99.06%) is land and 0.135 square miles (0.35 km2) (or 0.94%) is water. Des Plaines is traversed by two interstate highways – I-90 (the Northwest Tollway) and I-294 (the Tri-State Tollway). Des Plaines is named for the Des Plaines River, which flows through it. The name is from 18th-century French referencing the American sycamore which resembles the European plane tree. Portions of Des Plaines are underlain by the "Des Plaines Disturbance", an area in which the layers of sedimentary rock are highly abnormal. This probably represents an ancient meteorite crater, 75 to 200 feet (23 to 61 m) beneath the town. The bedrock was highly fractured by the impact, with large blocks of sediment upended. The crater was eventually filled by glacial activity, so that no trace now remains on the surface. Addresses in the city limits of Des Plaines have their own numbering system. Areas in unincorporated Maine Township have Des Plaines postal addresses that follow the Chicago numbering system. Devon Avenue in Des Plaines is 3200 South, while it is 6400 North in Chicago. Golf Road runs through a large unincorporated area as 9600 North with a Des Plaines mailing address but is 0 North/South when entering the Des Plaines city limits. As sections become incorporated, they take on the city numbering system. For instance in 2003, land at 9661 West Golf Road, Des Plaines, became 2323 East Golf Road, Des Plaines, when it was formally incorporated into the city limits. The largest unincorporated areas are in the O'Hare area and east of the Tri-State Tollway. As of the census of 2000, there were 58,720 people, 22,362 households, and 15,071 families residing in the city. The population density was 4,071.2 people per square mile (1,572.3/km²). There were 22,851 housing units at an average density of 1,584.3 per square mile (611.8/km²). The racial makeup of the city was 84.44% White, 7.65% Asian / Asian American, 0.26% Native American, 1.01% Black or African American, 0.02% Pacific Islander, 4.64% from other races, and 1.97% from two or more races. 14.01% were Hispanic or Latino of any race. Biggest ancestries: German (21.5%), Polish (18.2%), Irish (13.8%), Italian (10.6%), English (5.2%), Swedish (3.3%). There are 22,362 households, out of which 29.1% have children under the age of 18 living with them, 54.8% were married couples living together, 9.0% had a female householder with no husband present, and 32.6% were non-families. 28.5% of all households were made up of individuals and 13.3% had someone living alone who was 65 years of age or older. The average household size was 2.58 and the average family size was 3.21. In the city, the population was spread out with 22.3% under the age of 18, 7.5% from 18 to 24, 29.2% from 25 to 44, 23.8% from 45 to 64, and 17.2% who were 65 years of age or older. The median age was 40 years. For every 100 females, there were 93.6 males. For every 100 women age 18 and over, there were 89.6 men. The median income for a household in the city was $53,638, and the median income for a family was $65,806. Males had a median income of $42,241 versus $30,885 for females. The per capita income for the city was $24,146. About 3.0% of families and 4.6% of the population were below the poverty line, including 4.8% of those under age 18 and 4.8% of those age 65 or over. A notable amount of Cook County residents reside in unincorporated areas which use a Des Plaines zip code. These areas are densely populated and consist primarily of high density, multi-family housing with a very high percentage of foreign born residents. In the 2000 census the population of these unincorporated areas of Cook County assigned Des Plaines zip codes was 25,617. This unincorporated area has never been a part of the city of Des Plaines, and the majority of this area is separated from the actual city of Des Plaines by a belt of Forest Preserve lands and a Tollway barrier created by I-294. As of 2010, the median income for a household in Des Plaines had risen to $63,528. As of 2009, per capita income has risen to $30,453. China Airlines maintains their Chicago office in Des Plaines. It was previously located in Michigan Plaza in the Chicago Loop. The Des Plaines Forest Preserve surrounds the Des Plaines River and spans most of the eastern border of the city. Methodist Camp Ground, listed on the National Register of Historic Places, predates the city (founded 1860) and is still active every summer with concerts, day camps, swimming & recreation, picnics, etc. Eileen Fisher, clothing designer. She was raised in Des Plaines. Shawn Green, right fielder with the Toronto Blue Jays, LA Dodgers, Arizona Diamondbacks, and New York Mets; two time all-star; born in Des Plaines. Jacky Rosen, United States Senator from Nevada (2019-present). She was raised in Des Plaines until her family moved to Arlington Heights, Illinois when she was in high school. Des Plaines is featured in the Left Behind series of novels as well as an American Girl book. The majority of the hit 1985 film The Breakfast Club was filmed at the now-defunct Maine North High School located in unincorporated Des Plaines. ^ "U.S. Census Bureau Delivers Illinois' 2010 Census Population Totals, Including First Look at Race and Hispanic Origin Data for Legislative Redistricting". U.S. Census Bureau. Archived from the original on February 19, 2011. ^ "City of Des Plaines". Geographic Names Information System. United States Geological Survey. ^ a b c "Profile of General Population and Housing Characteristics: 2010 Demographic Profile Data (DP-1): Des Plaines city, Illinois". U.S. Census Bureau, American Factfinder. Retrieved February 11, 2013. ^ Des Plaines Centennial Program (1935). Des Plaines Centennial Celebration, June 25–30. Des Plaines, IL. p. 17. 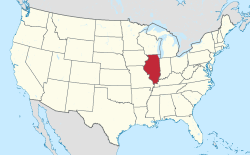 ^ "History, Des Plaines, Illinois (IL)". City of Des Plaines. Archived from the original on October 12, 2011. Retrieved March 16, 2010. ^ Des Plaines Centennial Program (1935). Des Plaines Centennial Celebration, June 25–30. Des Plaines, IL. p. 21. ^ Andreas, Alfred Theodore (January 1, 1884). History of Cook County, Illinois: From the Earliest Period to the Present Time ... A.T. Andreas. p. 493. ^ Wolfram, C.A. (1885). When Des Plaines Was Young. The Des Plaines Suburban Times. p. 22. ^ "Des Plaines gets last casino license". Chicago BreakingNewsCenter. Chicago Tribune. December 22, 2008. Archived from the original on February 15, 2009. Retrieved March 16, 2010. ^ Garcia, Monique (October 6, 2009). "Des Plaines casino construction to start in March, developer says". Clout Street. Chicago Tribune. Retrieved March 16, 2010. ^ Krishnamurthy, Madhu (January 26, 2010). "Des Plaines planners approve huge casino complex". Daily Herald. Retrieved March 16, 2010. ^ https://www.geocaching.com/geocache/GC1JPGG_the-des-plaines-disturbance?guid=8040e282-47ab-44ed-959e-9f81ba3a13fe accessed Dec 22, 2018. ^ https://www.chicagotribune.com/news/ct-des-plaines-disturbance-20170207-htmlstory.html accessed Dec 22, 2018. ^ "North America Archived November 28, 2011, at the Wayback Machine." China Airlines. Retrieved on August 30, 2011. "1011 East Touhy Ave., Suite #110, Des Plaines IL60018"
^ "北美洲地區." China Airlines. Retrieved on April 24, 2010. "芝加哥營業所 Chicago Mini Office 225 North Michigan Ave., Suite 1880, Chicago, IL 60601, U.S.A."
^ "Branch Offices North America Archived November 28, 2011, at the Wayback Machine." China Airlines. Retrieved on January 21, 2009. "Chicago Mini Office 225 North Michigan Ave., Suite 1880, Chicago, IL 60601, U.S.A."
^ Sammons, Mary Beth (November 26, 1995). "Patterns of the Past". Chicago Tribune. Retrieved December 13, 2018. ^ Gildea, William (August 6, 1999). "An Heir Apparent Worthy of Hank Greenberg". Washington Post. Retrieved March 13, 2019. ^ Kimberly, James (January 30, 2008). "Democrats could run veteran against Roskam again". Chicago Tribune. Retrieved April 22, 2008. ^ Messerly, Megan (October 15, 2018). "Jacky Rosen: From politically invisible to the center of a critical Senate race". The Nevada Independent. Retrieved December 7, 2018. ^ https://www.imdb.com/title/tt0088847/locations accessed Dec 22, 2018. Wikimedia Commons has media related to Des Plaines, Illinois.